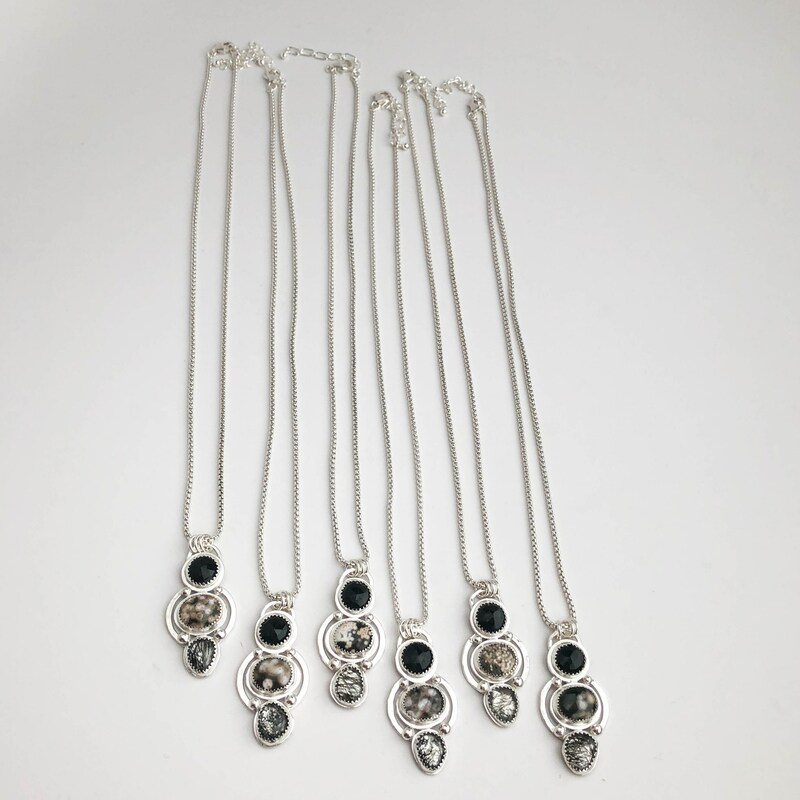 * The sterling silver chain is a nice heavier weight rounded box chain that is adjustable from 18" -20" with a lobster claw clasp and built in extender chain. 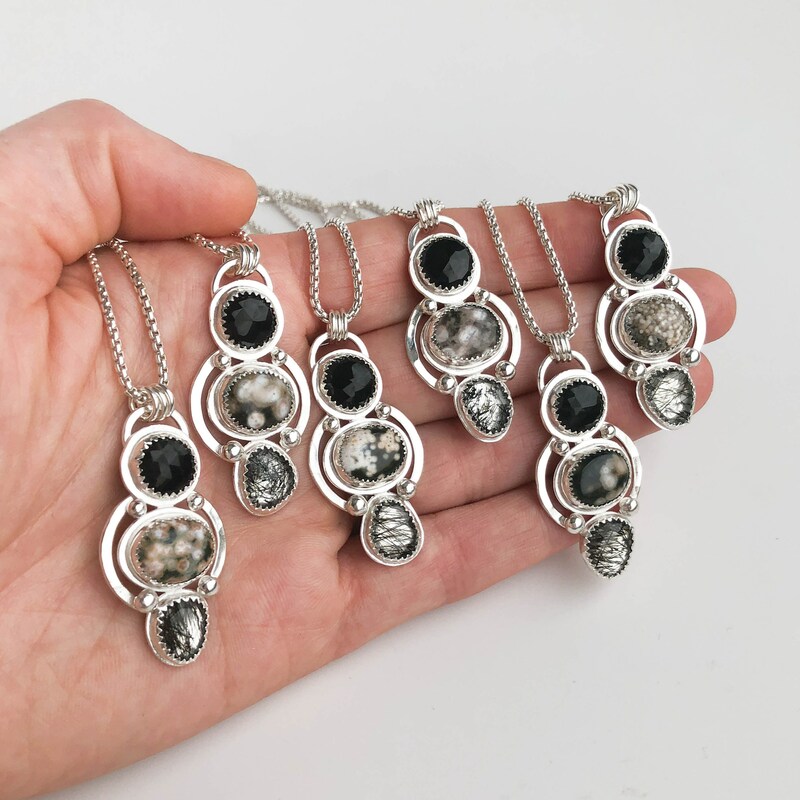 * The pendant measures 1.75" long and just under an inch across at the widest point. 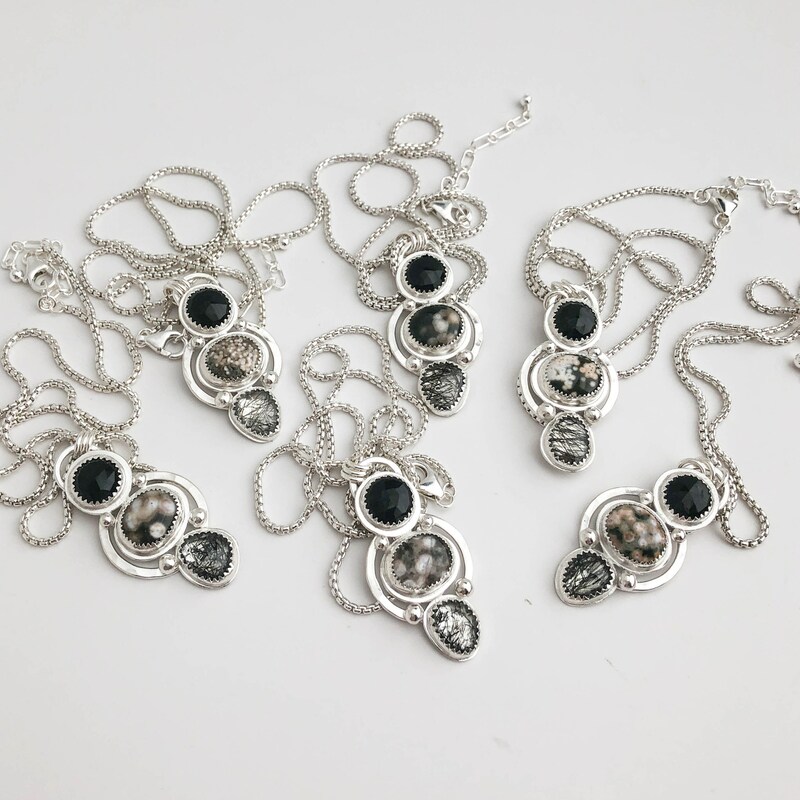 * We use natural free form gems in this design so you can expect slight variations. Six are available as shown in the photos, you will get one of the 6 shown. Each one is unique and no two are exactly alike. 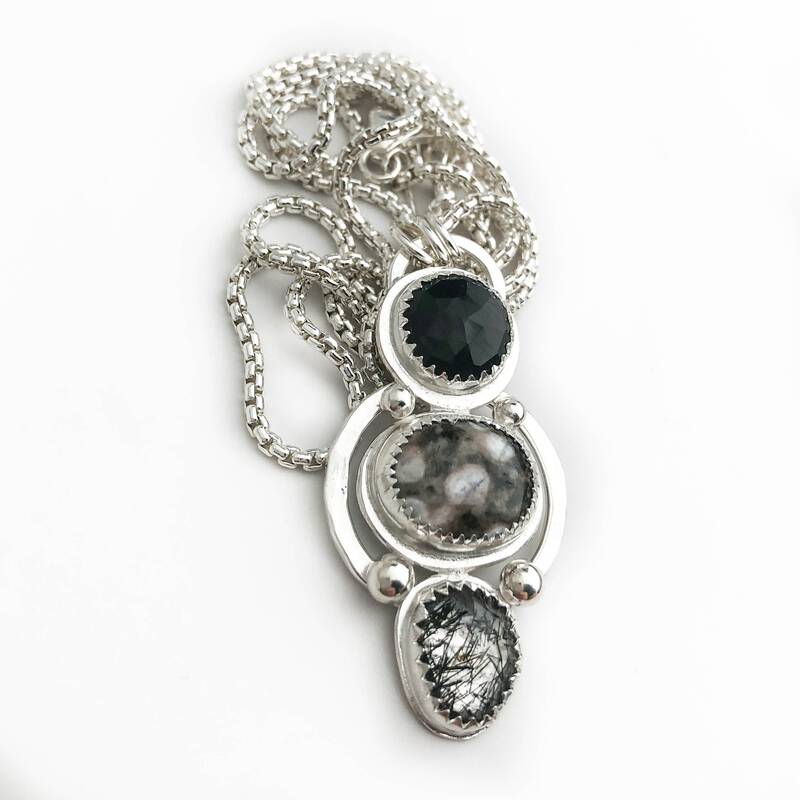 This unique pendant necklace was created with natural gemstones and solid sterling silver. 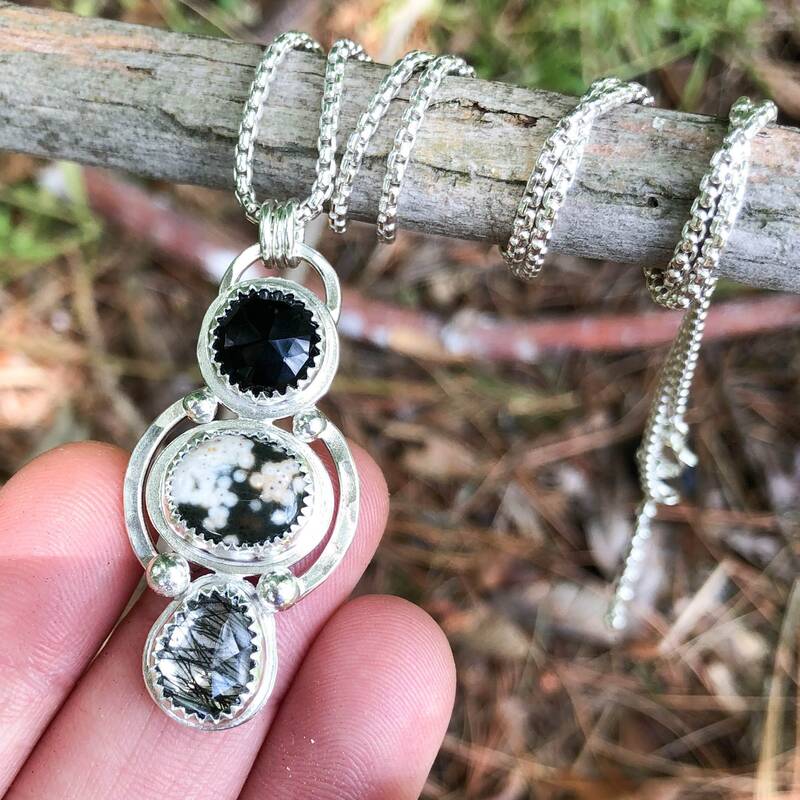 I created custom bezel settings for each of the stones and accented them together with tiny sterling silver balls and a hand hammered silver circle. 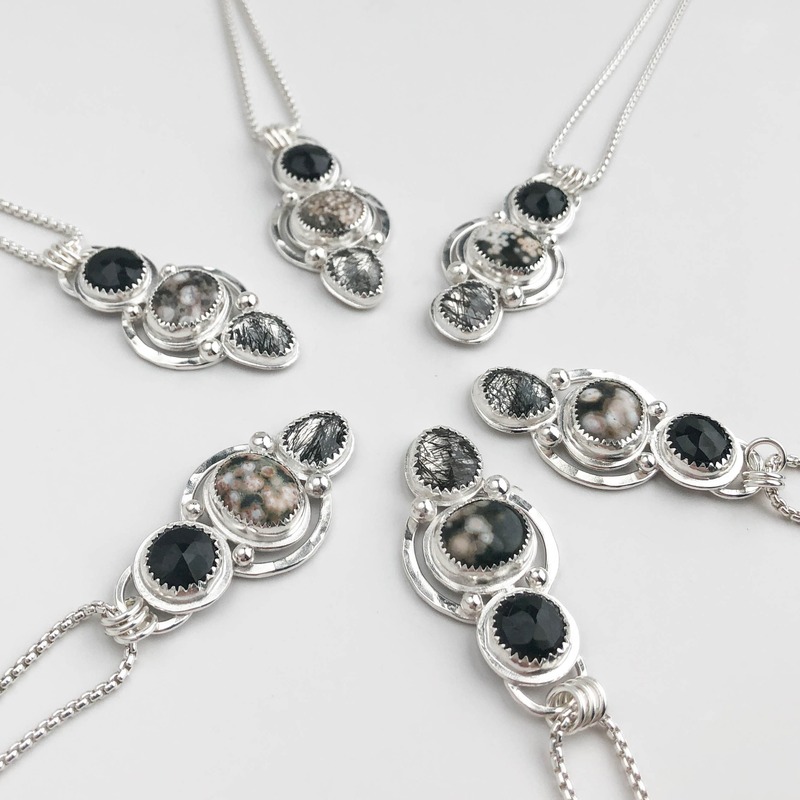 The top stone is a beautifully faceted black onyx gemstone with just the right amount of sparkle and shine. 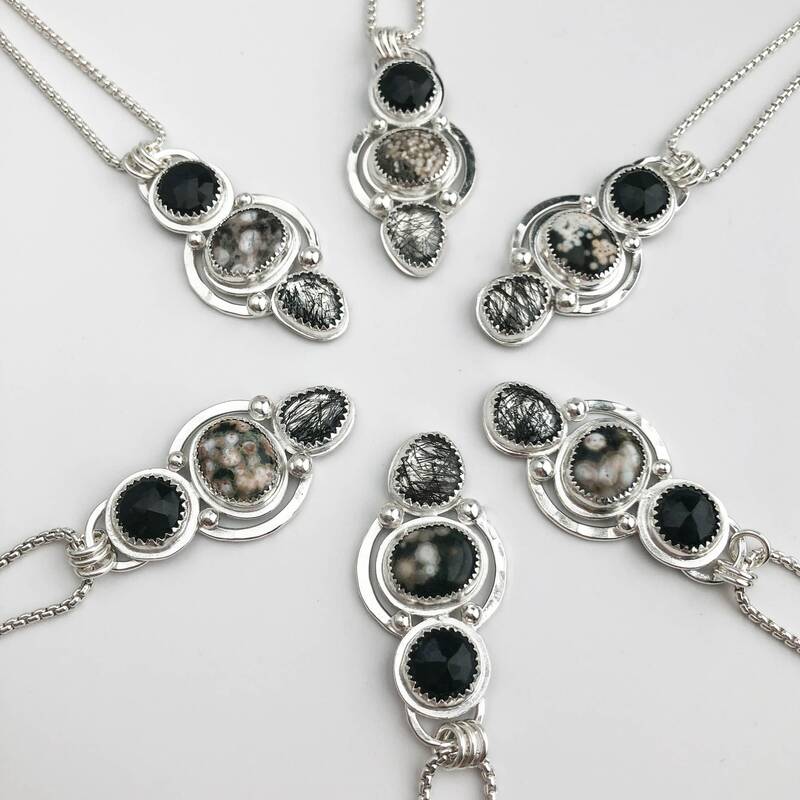 The center stone is an ocean jasper stone with gorgeous patterns and a nice neutral color palette. The bottom stone is a rose cut tourmalinated quartz gemstone. 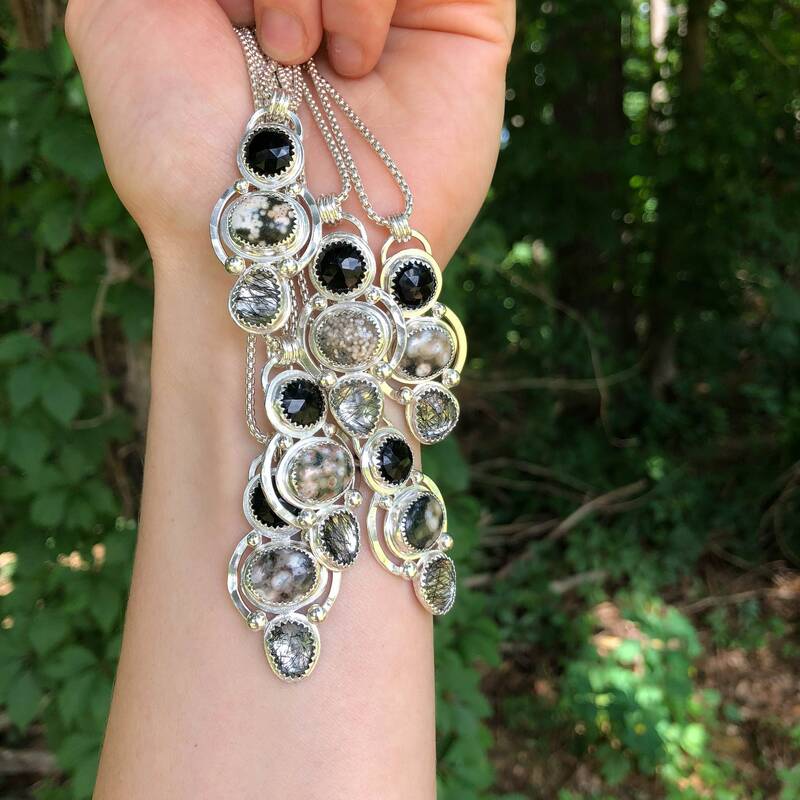 This is a natural quartz stone that has black tourmaline crystal inclusions forming within it to give those threadlike dark areas. The stone is transparent and I gave the inside of a setting a high polish so light would reflect through the stone and give it a nice glow. This necklace was even more beautiful in person that in the pictures. It literally took my breath away when I opened the box. Thank you so much! 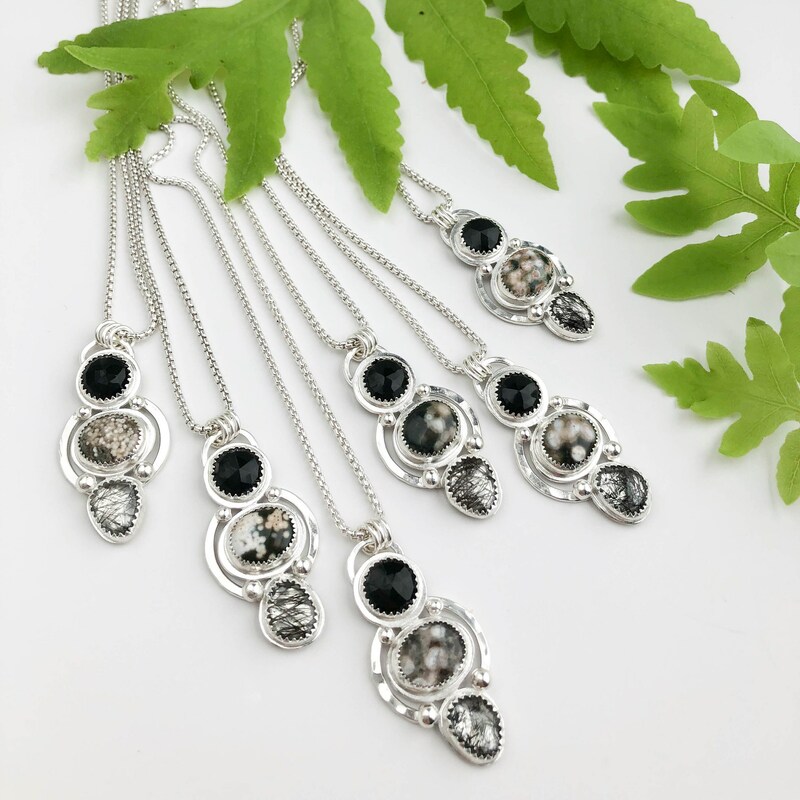 This pendant is just stunning-much more beautiful than picture shows-the stones look so great together-and the silver work is amazing! The chain is substantial and beautiful too! 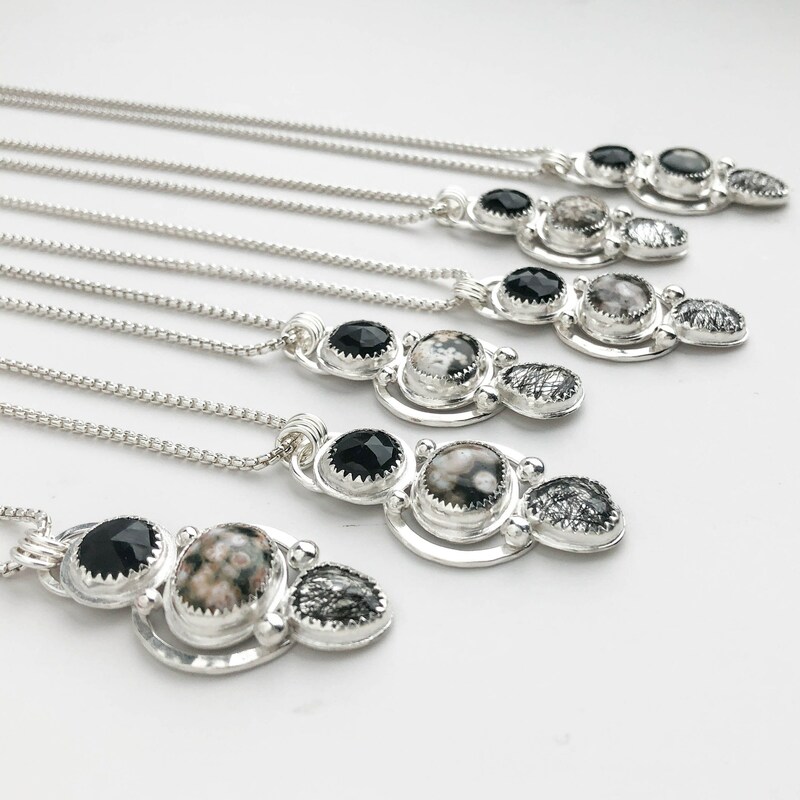 If you are looking for a statement piece this is it! And be sure you will receive many compliments! Thank you Roxann and Paul.